Benedictine Professor: Why Are Almost All of the Cardinals and Bishops Silent? 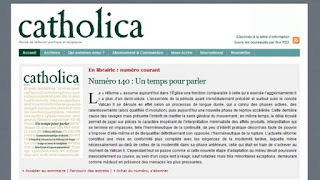 Current issue of "Catholica". Why are almost all cardinals and bishops silent about the end of Catholicism that Pope Francis brings about? The "other understanding of the Church" behind Amoris laetitia. 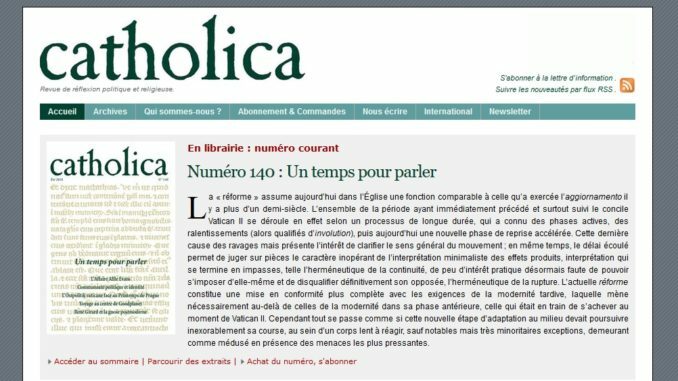 (Paris) The international magazine for culture, politics and religion, Catholica, which has been published in France for 30 years, counts "well-known authors such as Émile Poulat, Robert Spaemann, Ernst Wolfgang Böckenförde, Vladimir Bukowski, Stanislaw Grygiel, Thierry Wolton and Jacques Ellul and Pietro De Marco," says Vatican writer Sandro Magister. 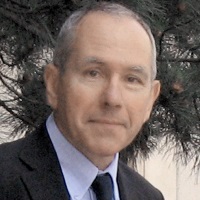 The editor-in-chief is Bernard Dumont. In its latest issue, Dumont, whose editorial is also freely available on the Internet, deals with the "unbelievable" silence of almost all cardinals and bishops - with the exception of the four signatories of Dubia - "the dissolution of the traditional form of catholicity by the pontificate of Jorge Mario Bergoglio has been set in motion." Bernard Dumont discusses the apparently desired end of "Roman Catholicism" without, however, raising an outcry, as the historian Roberto Pertici once complained. The end is proclaimed by Rome or those who invoke Rome, and all are silent and seem to submit to the inevitable fate. See the analysis of Prof. Pertici: The reform of Pope Francis was already written by Martin Luther . Dumont also published in the new edition the text of a Benedictine monk and theologian who analyzes and criticizes "perhaps the most radical upheaval in Catholicism of our time." No longer does the sacrament have primacy in the Church, of which the Second Vatican Council said it was the "culmen et fons" of the life of the Church, but ethics. This subversion is also reflected in the question of remarried divorced as well as the inter-communion with the Protestants. The Benedictine theologian is Fr. Giulio Meiattini, who this year already published the monograph "Amoris laetitia? The Sacraments Reduced to Morality" (publisher La Fontana di Siloe, Turin 2018). He is a monk of the Benedictine Abbey of Madonna della Scala in Noci and Professor of Fundamental Theology at the Theological Faculty of Apulia and at the Pontifical Athenaeum Sant'Anselmo in Rome. Meiattini accuses Pope Francis and his whisperer, Cardinal Walter Kasper, of promoting "cunning" rather than the much-cited "distinction." There is cunning in Amoris laetitia and the mind behind it. "The state of confusion is obvious". With these words the theologian and monk begins his essay. It is claimed that the confusion is only supposed, and only the result of a new style of government. Such a picture of the current situation is not something Fr. Meiattini takes pleasure in. "Can the confusion and disagreement between bishops on tricky points of faith be fruits of the Holy Spirit? Not in my opinion." Then Meiattini indicates that in the matter of remarried divorced people a ready-made plan was pursued from the beginning. With the opportunity of being able to deliver the only speech in February 2014 to the Cardinals' Consistory procured by Pope Francis, Cardinal Kasper "laid the groundwork". Nevertheless, two bishops' synods failed to produce a common line to the problem being discussed. Anyone reading the reports of the "circuli minores" of the 2015 Synod can easily see that there was no common position. The pope would have had to examine and understand, which would have been the first task of "distinction", "which processes" would be initiated and pursued, and which not. However, such a distinction did not take place. The path taken was not changed. The fact is that a large majority of the Synod Fathers wanted "no change in the traditional order". The editorial committee of Relatio finalis therefore took care not to include any innovations in the text. For this reason, a "small step," according to Meiattini, was undertaken instead of a big one: The editorial committee formulated some undefined positions, which meant a "change of atmosphere". The non-rejection of these ponderous formulations, which received the necessary two-thirds majority only with extreme difficulty, sufficed that the next "small step," with some ambiguous footnotes in Amoris laetitia, were sufficient to indicate a new direction. These small steps, which, strictly speaking, did not reinforce the traditional position, were enough to split the episcopate. The next step was papal confirmation of the guidelines of the ecclesiastical Province of Buenos Aires on the Eighth Chapter of Amoris laetitia. In reality, these guidelines are not mere interpretations, because they contain statements and instructions that were neither found in Amoris laetitia nor adopted by the synods, and never found a majority there. Through a series of "small steps", a "big step" was finally taken within three years, with a profound intervention. But this has nothing to do with "synodality," according to Meiattini. Faith would be reduced to ethics in Amoris laetitia , that is the total thrust. "Ethics has neither the first nor the last word." "I do not understand how the Bishop of Rome can write such a thing"
"To be honest, I can not understand how a bishop, especially that of Rome, can write such sentences: 'One should not burden two limited people with the tremendous burden of perfectly recreating the union that exists between Christ and his Church '(AS, 122)." This formulation is an expression of a very different way of thinking: A gospel ethic, freed from the sacrament, becomes a "mighty burden" rather than a "sweet yoke" and a "light burden." Such a statement can only be reached if one understands Christianity - perhaps unconsciously - only as ethics. In this way we arrive at results that correspond to the Lutheran concept of simul iustus et peccator, condemned by the Council of Trent. Intercommunion with the Protestants follows the same logic. What is only decisive is the presumed, inner feeling. For the objective criteria, all conceivable attenuating circumstances are taken into account, and the subjective decision of conscience is decisive. Why, then, according to this pattern, should not even a Buddhist or a Hindu be able to receive the Catholic Eucharist, according to P. Meiattani? "Damaging the relationship between morality and sacraments can ultimately lead to a non-Catholic understanding of the Church." 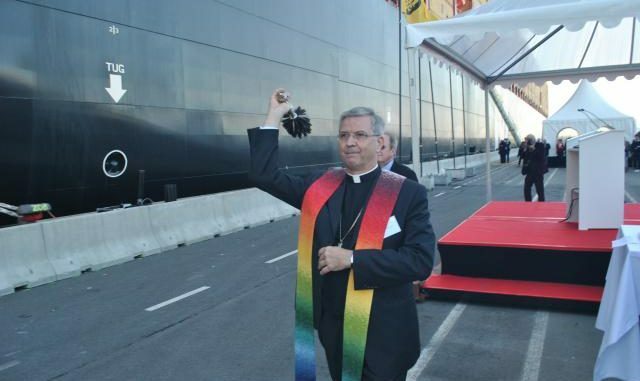 Bishop Bonny (Antwerp): "New Rituals for the Blessing of Aberrosexuals and Second Marriages"
(Brussels) Johan Bonny, the Bishop of Antwerp in Belgium, wants a private ritual to bless gay couples, second marriages and "wild marriages". On the 6th of October, the Gazet van Antwerpen reported the plans of the bishop. In a few days, on 11 October, Bonny's book " Mag ik? Dank je. Sorry.Vrijmoedige dialoog over Relaties, huwlijk en gezin "(May I? Thank you. Sorry. Frank dialogue about relationships, marriage and family) will appear. As the Antwerp newspaper reported, the bishop is thinking aloud about "new religious rituals." In cooperation with Roger Burggraeve (Emeritus Professor of Moral Theology at the Theological Faculty of the Catholic University of Leuven ) and Ilse Van Halst (editor of the Antwerp church newspaper Kerk & Leven ) he says of the resulting book: "The question is whether we were able to put it all in a single model." "Should we not develop various rituals in which we can recognize the reality of life between homosexuals and also from an ecclesiastical and religious perspective? Because, says Bishop Bonny, homosexual couples can enter into an exclusive and long term relationship. "The deep symbolic bond between the different sexes and the fertility of this relationship, becomes the real sacramental covenant," reported the newspaper about Bonny's theses. Even remarried divorcees, says Bonny, demand a differentiating approach. The Antwerp Bishop "believes that the Church in some cases can bless a second union," wrote Gazet van Antwerpen . "It is known that the Orthodox Church traditionally practiced the confirmation of a new union for reasons of charity, which allows the new couple to find a place in the community. This new blessing is not a repeat or a substitute for the first sacramental marriage. That was and remains unique." Johan Bonny was in 2008 at the request of Cardinal Godfried Danneels and with the help of the then apostolic nuncio in Belgium, Karl-Josef Rauber, named by Benedict XVI. as Bishop of Antwerp. Cardinal Danneels, at that time Archbishop of Mechelen-Brussels and Primate of Belgium received criticism because of his liberal views and aberrophilic church policy. 2010, where there were spectacular house searches in the episcopal palace and a scandalous grave desecration by the Belgian police, of the graves of departed bishops. There were no findings, and no official apology. Danneels survived everything. Only Pope Benedict XVI. sought to correct the liberal course of the Belgian Church. This had previously become highly visible in the year, when only a single bishop defended the German Pope against the unprecedented criticism by the Belgian Parliament. The Parliament, unique in its history, had condemned the Pope's statement in a formal resolution, during his visit to Africa where he had reaffirmed the ecclesiastical condemnation of artificial contraception. Catholic Action Flanders published this picture in response to Bonny's statements about a homo-event. What do children probably think of the picture, who are the irresponsible ones there? Against Cardinal Dannneels' wishes, Benedict XVI. named this single courageous bishop, André-Joseph Léonard of Namur, as Primate of Belgium in January 2010. From the majority of progressive Church in Belgium, this was regarded as an unprecedented affront, one for which it has never forgiven Benedict. Nuncio Rauber, who was standing with these groups in the best of terms, led an outrageous media campaign and criticized the decision of Benedict publicly, which resulted in a dismissal from Belgium and Luxembourg and - because he had just become 75 - to retire. Cardinal Danneels was, as was announced on 23 November 2014 in a book on the pope by the Englishman Austen Ivereigh, that along with Walter Kasper and Karl Lehmann, he had organized "Team Bergoglio"," for the election of Jorge Mario Bergoglio in conclave of 2013. On September 22, in 2015. this became known by a Danneels biography and from his own mouth that he was, since the 90s subversive, belonging to clandestine circles within the Church. Named after the meeting in Sankt Gallen in Switzerland and founded by the Cardinal Carlo Maria Martini SJ, deceased in 2012, the aim was to achieve the election of a progressive pope and to boycott the activity established by the "restorative" Popes John Paul II. and Benedict XVI. Danneels explained frankly that the members of the secret circle thought of themseleves as "the Mafia." After the election of Pope Francis the bounty did not remain. Archbishop Leonard was denied the dignity of Cardinal. This however was a humiliating slap for Leonard and for Benedict XVI. for former Nuncio Rauber . Francis retired Leonard at 75 years, although he was in perfect health. The new Archbishop and Primate was Joszef De Kesel, Danneels' preferred candidate before the "accident" Leonard. The attempt at a turnaround in the liberal occupied Belgian Church, which Pope Benedict XVI. had tried timidly, has since been considered "eradicated". Archbishop De Kesel called a few months after taking office for the abolition of priestly celibacy from, an old demand of the ecclesiastical '68ers. In this context, there was also the expulsion of a "too conservative" French priestly community of Belgium whose ability to attract priestly vocations in a considerable volume, bothered the usual complaint [pretext] over the "prevailing lack of priests." Bishop Bonny attracted considerable attention by an accentuated aberroophilic attitude. The turn of 2014/2015 saw the demand that the Church should recognize homosexuality stir. A Petition from faithful Catholics, turned to the Pope and demanded a clarification of the question whether Bonnys Homo-looking statements "are Catholic or not." Rome remained silent. Instead Bonny was summoned by the Belgian Bishops 'Conference in June 2015 appointed to Synod for the Bishops' Synod on the family. Pope Francis in turn appointed Cardinal Danneels personally to synod. On May 6, 2015 Primate Leonard completed his 75th year. On November 6 De Kesel was announced as his successor. With that, the "reconquest" of Brussels was successfully completed by progressive church circles. (Rome) Cardinal Walter Kasper has adopted gender ideology and is calling for the participation of women at the next conclave. 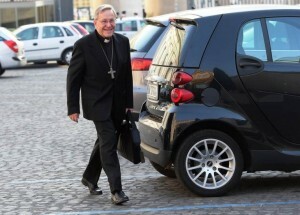 Whether the German cardinal also calls them Cardinalettes, is not clear coming from his remarks. Anyway, if it were up to him, women would vote as papal electors in the next conclave. "It is theoretically possible that women participate in the election of a pope. The composition of the group, which is tasked to choose a pope is not the subject of a divine mandate. 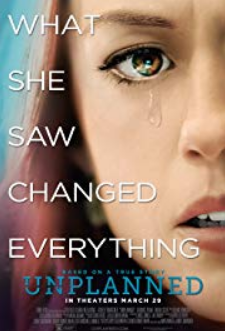 This thing can change." The cardinal expressed those words last Monday in Rome at the launch of the new special edition "Maria's Daughters - The Church and Women" by Herder Korrespondenz, as katholisch.de the news page of the German Bishops' Conference reported. 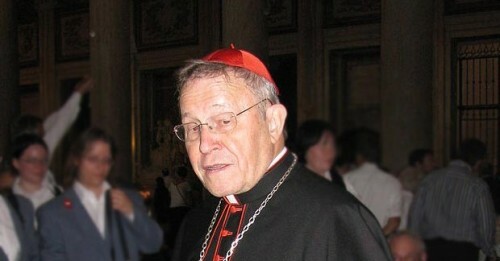 in Church history of the last 1,000 years"
(Rome) While Cardinal Walter Kasper called Amoris laetitia "the most important document of the Church's history in the past 1000 years," his great adversary in the Synod of Bishops in 2014, "Cardinal Raymond Burke" (Sandro Magister), clings to formal restrictions. There is no shortage of parts of the Church that match vociferously with Kasper's assessment. This includes the daily newspaper Avvenire of the Italian Episcopal Conference . It is headed by another papal confidant, Bishop Nunzio Galatino. The daily sees Amoris Laetitia not just "according to the thinking of a wise father," but exactly how Cardinal Burke does not want to see it. Namely, a regular document of the Magisterium Amoris Laetitia which was a "revolutionary" document that sealed "by archiving pastoral prohibitions and constraints," and "that had turned more into a reading of the code of canon law, instead of the Gospel." "Poor Cardinal Burke, who clings to codes and commas"
"Poor Cardinal Burke, a great canonist, who clings to nothing but codes and commas ...", said the Vatican expert Sandro Magister. "Undoubtedly," said Magister, Pope Francis has also thought of Burke, when he speaks of the Article 305 in Amoris Laetitia, writing of those who know "only how close their heart only with moral laws...", "as if they were boulders that were thrown on the lives of people. " In comparison, the proponents of the "pastoral reorientation" (Cardinal Schönborn) appear to have an easy time. They offer to people supposedly what they want to hear. Even Cardinal Walter Brandmüller, another Cardinal who had rendered outstanding services in the past two years to defend the sacrament of marriage, has so far limited his formalistic criticism of Amoris Laetitia. The content of the post-synodal letter was not the problem, but the false interpretations. In other words, what the Pope says, that it is all right, it is just misunderstood. A reading of this pontificate, which was bumpy from the start and easily turns into a stumbling block, just as now. Cardinals Burke and Brandmüller in not criticizing the pope, are forced to resort to a sideshow and to steer clear of the actual battlefield. Criticism of Amoris Laetitia turns out to be weak when it renounces the direct, substantive confrontation. While some are going onto the sidelines, Cardinals like Kasper and Schönborn roll ahead at full speed on the main line and announce the exact opposite. They talk about content and refer explicitly to Pope Francis. The do not address formal questions. The weakness of the cardinatial resistance is homemade in this case because the cardinals themselves are possessed of their strongest means, when they bring forth a substantive confrontation. What are they afraid of? Are they afraid of the consequences? What consequences? Is it not perhaps a lack of the insight on the part of the papacy, which proves to be the inhibition? Both cardinals seem to be aware of the weakness of their own reasoning. Sandro Magister points out that both Burke and Brandmüller, for example, don't dispense quite completely with a substantive review. 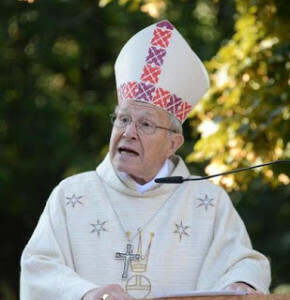 Cardinal Brandmüller explained to the Bild newspaper that it was unacceptable to grant exemptions to the Communion ban for people living in the state of the public and persistent adultery. This is categorically impossible for religious reasons and also in individual cases. Cardinal Burke sees the danger in a dangerous misconception that in Amoris Laetitia the formulation of marriage as an "ideal" may arise. "In the document, there are numerous references to the "ideal marriage." Such a description of marriage can be misleading. You can lead the reader to think that marriage is an eternal idea of what men and women approach more or less under varying circumstances. But Christian marriage is not an ideal. It is a sacrament that gives the grace of a man and a woman to live in a true, lasting and fruitful, mutual love," said Cardinal Burke. The self-imposed ban against criticizing the Pope proves to the defenders of religious marriage and morality as a major weakness because it is structural. With consistent compliance, it gives the other side an almost insurmountable advantage and can be repeated as well as on other matters. The self-limitation is anachronistic anyway because Pope Francis had given his critic Antonio Socci a free pass in which he explained that the criticism is legitimate and is thought to be, according to Socci, that the criticism was "good for" the Pope. Socci had nevertheless doubted the legality of the Pope's election for half a year. In a time in which the Pope is himself the engine of controversial breaks, faithful Catholics, particularly the so-called "conservatives" have to rethink their attitude towards the Pope. They will not fail to be bound and soon will not be able to check if and how they have been weighed down by the erroneous ballast of the papacy. And they will have to get rid of it if they want to fulfill their duty to defend the immutable doctrine. Then to hoped that the pontificate of Francis might not be long, could yet prove to be as double-edged as the prohibition of criticism. 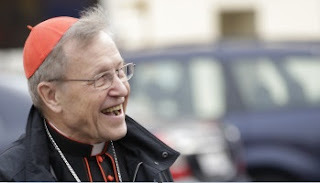 The Results of the Family Synod: Cardinal Kasper "I am very pleased"
(Rome) Cardinal Walter Kasper is "very pleased" about the result of the Synod, although Communion for the divorced and remarried wasn't mentioned once. "When the result of the Synod is agreed to by Kasper, then it is time to be worried," says Secretum meum mihi. Il Giornale: Your Eminence, in the Synod your line has predominated, that is to say, the possibility to allow remarried divorcees to communion through an individual assessment. How do you rate the discussion of the Synod Fathers on this subject? Kasper: I am pleased to open the door to the possibility of the divorced and remarried to communion. There is a certain opening, but you do not even talk about the consequences. Now everything is in the hands of the pope, who decides. The Synod has made recommendations. There has been an opening, but the matter is still not completely resolved and needs to be further deepened. Il Giornale: If it is, the priest stands there to decide on a case by case basis, what is meant by that? Kasper: There needs to some conditions given for admition to the sacrament of the Eucharist. First, the assessment of whether everything possible has been done possible to save the first marriage; then that there is a way of repentance for the couple. Then there must be a path of reflection and accompaniment, because divorce is a disaster and leaves traumatic experiences. It takes time to overcome the wounds of separation. Il Giornale: But running such an opening does not risk confirming divorce? Kasper: Yes, the doors are not opened for divorce. The pastor must do everything possible to reconcile the couple. Divorce is never a pleasant thing and is a sad moment, especially for the children of the couple. Il Giornale: There were elements of "disorder": The Coming out of Monsignor Charamsa who professed to be gay, have the letter of the 13 cardinals, who have criticized the methods of the Synod work, the dissemination of the message through QN, the pope's benign brain tumor. Has all the Synod work destabilized? Kasper: The Synod can not be manipulated. We have gone further in our work and in accordance with a fixed agenda, without having us be influenced or manipulated by external factors. Il Giornale: the Synod, however, has not come to an agreement about homosexual relationships. Kasper: The theme of the Synod was the family and homosexuals are not the family. We have not dealt with the subject of homosexual partnerships, but only with the presence of persons with homosexual tendencies within a family. The Church must help with these situations, one must help, not discriminate. Il Giornale: What do you now expect from the Pope? Kasper: I hope that the Holy Father has written a compelling text that emphasizes the joy of Christian marriage, which is the most important thing. The indissolubility of marriage is not up for discussion, but there is no contrast between mercy and truth of the Gospel. Il Giornale: When can we expect Francis' decision? Cardinal Kasper: It takes time, it is not a document that you do from one day to the next. 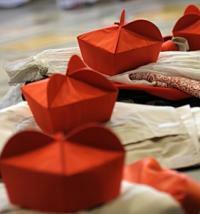 The final report of the Synod is a foundation for the Pope. I hope that the text of the Pope comes during the Year of Mercy. That would be a nice sign. Secretum meum mihi adds: They were still worried about the result? Now you have a reason to be there. (Rome) Pope Francis appointed the Archbishop Carlo Cardinal Caffarra of Bologna and Cardinal Raymond Burke Patron of the Order of Malta last Saturday during his US visit as members of the Congregation of Saints. Both cardinals are considered enemies of the "New Mercy" and have come forward with a view to the upcoming Synod of Bishops on the family to speak in active defense of Catholic marriage and morality. Both belong to the five cardinals, who caused a sensation in the past year throughout the Church with the book "Remain in the Truth of Christ." Cardinal Burke was recognized as the de facto spokesman in the Synod of Bishops 2014 against the proposal by Cardinal Walter Kasper, who wanted to allow so-called remarried divorcees to the sacraments. The same applies to the attempt to recognize aberrosexuality. After the election of Pope Francis, the US Cardinal had become among the most outspoken critics of the reigning pope, who publicly voiced his respectful and relevant opposition. The clash took place mainly at the "non-negotiable values" (Benedict XVI.). The Cardinal, well-known for his precise thinking also came into conflict with Pope Francis because of vague and ambiguous formulations. It's an attitude that did not sit well with Pope Francis. Shortly after the conclusion of the Synod of Bishops, the Argentine Pope removed the renowned canon lawyer as prefect of the Apostolic Signatura and removed him from the Roman Curia. 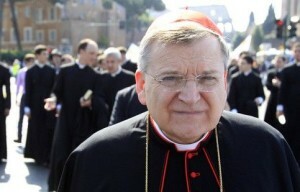 Cardinal Burke will, therefore, not participate in the beginning on 4 October Synod of Bishops. Previously, the Pope had not confirmed Burke's membership in the Congregation for Bishops and the Congregation for Divine Worship. The situation is different for Cardinal Caffarra. The profiled Italian shepherd enjoys the confidence of Pope Francis, so it is said in Rome. Like last year, Cardinal Francis had named Caffara personally to synod. Caffarra is one of the weightiest voices against gender ideology. For Cardinal Caffarra this is the first appointment to the General Assembly of a Roman Congregation. Previously, he was already a member of the Pontifical Family Council. In Case the Synod Takes a "Strange Turn"? "Remain True!" (Washington) This past September 13, Cardinal Rayond Burke, who was removed by Pope Francis from the Roman Curia for being the spokesman of Kasper's critics, spoke in St. Louis about "the truth of Christ in marriage." The Cardinal Patronus of the Sovereign Order of Malta addressed the spiritual, social, doctrinal and canonical aspects of the crisis, in which marriage and the family in Western culture find themselves. The cardinal spoke of a great confusion and rebellion inside the Church. Cardinal Burke stressed that in "our" increasingly secularized and a hostile world the greater responsibility lays on the shoulders of parents to mold the children by word and example, and to teach them the true meaning of Christian marriage. Along with the authentic, always valid teaching of the Church, the healthy family formation for children and young people will prove to be the main source for their guidance, as a key means by which Christian truth will be passed to the next generation. Resistance to Kasper Proposal - New Nullity of Marriage "Could Cause Problems" "
The cardinal suggested the book was published in 2014 shortly before the Synod of Bishops "Remaining in the Truth of Christ" of five cardinals, including Burke, for reading. In Saint Louis, he reaffirmed his categorical opposition to the proposal by Cardinal Walter Kasper, allow divorced and remarried to the sacraments. The Cardinal Patron, an excellent canonist, also expressed that there could be some problems because of the new provisions announced on September 8 by Pope Francis on the nullity of marriage. The new rules, says the cardinal, would require a lot of caution and a particularly attentive interpretation in the light of the long canonical and doctrinal tradition of the Church. A negative example Cardinal Burke mention the suspension of the double judgment for the nullity of marriage in the United States during the period of 1971 to 1983. The American "experiment" of "rationalization" [Streamlining] of the marriage annulment process has led in practice to general laxity that had become perceived as a "Catholic divorce". That was one reason why the Code of Canon Law of 1983 had restored the duty of appeal in the second instance, as it had been introduced in 1740 by Benedict XIV..
Divine law will be, "only more Ideal"
To spread "confusion," says the cardinal, it is also put in effect that today the divine law would put marriage and chastity down as mere "ideals", that demand a need for heroic holiness in ordinary Catholics. Such an attitude, in turn, leads to false ideas about "mercy", as well as the admission of Catholics to the sacraments, who are in the state of mortal sin, because the ideal is unattainable anyway. Cardinal Burke stressed however, that the teaching of Scripture and the Church says that God's gift of grace are always sufficient to resist any temptation and to obey His commandments. For this, however, there is a condition: The faithful must turn in humility, with trusting faith and unceasing prayer to Him. At the end of his speech he replied to the question of what Catholics should do if it should come to a "strange twist" at the upcoming Synod. Cardinal Burke's prompt response consisted of only two words: "Remain true!" (Rome) "Remain in the truth of Christ" The publication of the book was accompanied in 2014 by heated polemics. Back then five cardinals and several theologians worked on the anthology. 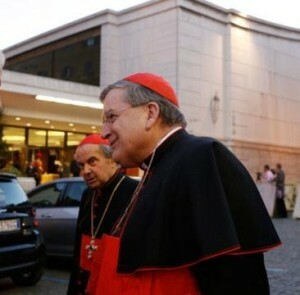 The initiator of the relevant publication and spokesman for the defense of Catholic moral teaching on marriage and the Synod was US Cardinal Raymond Burke. He was subsequently relieved of his duties of Dicastery head by Pope Francis and removed from the Roman Curia. It was a clear signal of what is tolerated and what is not desirable, though it was not necessarily with the desired effect. Now comes another book with the same concerns. This time it will be even eleven cardinals who step into the ring. If their book gets same fate as its predecessor, which had been so unwelcome in Rome that it never reached the synod? In 2014 even the publishers who produced the book in different languages, were accused of participating in a "conspiracy against the Pope". Cardinal Walter Kasper said openly it in an interview on September 18, 2014: "The aim of the polemic is not me, but the Pope". It may be that this is a question of a defense strategy: It involves securing one higher than himself for his protection and by his authority bring critics to silence. The conspiracy thesis caused considerable outrage among other high dignitaries of the Church, which was a means of discrediting the former Bishop of Rottenburg-Stuttgart. The German cardinal was, however, not far wrong by referring to Pope Francis. Without the participation of the Argentine Pope, it would not come that the Kasperians got such a global platform. Cardinal De Paolis, one of the five involved in the former book, reiterated this, without naming Kasper. In the daily newspaper La Repubblica he said: "There are even some who speak of a conspiracy. There is no conspiracy; bring only the will a position to expression." In 2014 Non-Kasperians were silenced - 2015? Someone wanted in any case bring the dissenting voices to silence because they disturbed a path that was already clearly laid down, even though the pope had called for a "free" discussion. This "openness" was only valid in only one direction, while calls for "free" discussion on the other side an admonition? Or are there those under the Pope around Cardinal working autonomously and using only the large gates that the reigning Pope has opened? After all, all important positions of the Synod of Church representatives are held by those who have themselves known through their statements and actions as Kasperians. As La Nuova Bussola Quotidiana reported yesterday, the script could be repeated. It is true that a group of cardinals has worked on a new text that is to be opposed to opposing Kasper Group in the Synod of Bishops. The new book is likely the to bear the title "Marriage and Family" with the subtitle: "Pastoral Prospects of Eleven Cardinals." The group of Cardinals who are actively opposing has increased markedly over the previous year. Moreover, considering the considerable number of eleven cardinals, and that those churchmen witch most insight, see the possibility of a real threat of the Catholic marriage and morality, so there is thus not a "pipe dream" concerning anxious or even extravagant Catholics somewhere off in the wide world. Among the eleven cardinals, however, there are to be found - unlike rumor claims - neither Burke nor Cardinal Cardinal Brandmüller but Archbishop Cardinal Carlo Caffarra of Bologna, Major Archbishop Cardinal Baselios Cleemis of the Syro-Malankara Catholic Church and president of the Indian Bishops' Conference; Paul Josef Cardinal Cordes, Chairman Emeritus of the Pontifical Council Cor Unum ; Archbishop Dominik Duka of Prague, Cardinal, Primate of Bohemia and President of the Czech Bishops' Conference; Archbishop Willem Jacobus Eijk of Utrecht, Cardinal; Cardinal Joachim Meisner, Archbishop Emeritus of Cologne; Archbishop John Cardinal Olorunfemi Onaiyekan of Abuja, former President of the Symposium of Episcopal Conferences of Africa and Madagascar; Cardinal Antonio Maria Rouco Varela, Archbishop Emeritus of Madrid and former president of the Spanish Bishops' Conference; Camillo Cardinal Ruini, Vicar of Rome, Cardinal emeritus and former President of the Italian Bishops' Conference; Robert Cardinal Sarah, Prefect of the Congregation for Divine Worship and the Discipline of the Sacraments; Archbishop Jorge Liberato Urosa Savino of Caracas, Cardinal and Primate of Venezuela. "In Times of Increasing arbitrariness, the Church Must Speak More Clearly"
The editor of the book is the German canon lawyer, Winfried Ayman from the Ludwig Maximilian University of Munich. Last June, Aymans wrote in L'Osservatore Romano, "in times when civil law increasingly tends to expose the marriage contract to arbitrariness, in any event increases in every way, the preaching of the Church must be all the more clear." Also in this case, again all are accused of obstructing the debate or - worse - to oppose the Pope or even plotting against this? Someone there will certainly try. However, the number of cardinals who were already in the ring in 2014 has increased and those who have now followed seem unwilling to vacate the field. Their very large number should be food for thought. With so many Cardinals seeing the need to publicly defend the Church's teaching, then that can mean only one thing: someone is trying to attack this doctrine. Cardinals from Burke to Brandmüller, and Caffarra onward to Onaiyekan and Sarah will attempt to frustrate them. The eleven cardinals want, as far as it is known, to beat Kasper on the battlefield chosen by him, the pastoral. The German cardinal asserted and continues assert that he will not touch doctrine, but is "only" trying to change the Pastoral approach. Meanwhile, this thesis has been widely refuted as a fundamental intervention in the pastoral, will be automatically chang the teaching by the general practice. [That's how Vatican II was "won"] The eleven Cardinals deal with issues such as those who can be helped, like those who have been abandoned by their spouse and yet remain faithful to their marriage. A key issue of the new publication should be that marriage preparation can be improved, since it has proven to be obviously inadequate. It is also about the question of how the marriage preparation can respond to the situation only slightly or hardly, when the religiously instructed young people are also strongly influenced by a secularized culture. The publication of the book is scheduled for the second half of September. In Italy it is, as foreseen, to be released by the heavily besieged publisher Cantagalli. There are, again, planned translations into different languages. We can only hope that the attempt to get the book of eleven Cardinals to all synod participants, will be successful this time. The Book of Five Cardinals never came last year to the synod. The fault must belong to the post office, insists Cardinal Baldisseri, the Secretary General of the Synod of Bishops. Others suspect rather that the Synod Director prevented the delivery, in plain text, Baldisseri himself. Just as before, the issue in the room, is who is the great director in the background. Quite a few tap Pope Francis himself, who has not yet officially commented on the question of communion for the divorced and remarried. However, a long series of indirect statements, gestures and actions show him as a supporter of Cardinal Kasper and its thesis. Another book will be released to the Synod of Bishops, which also has eleven cardinals and bishops for authors. All are from Africa and want to make the voice of Africa heard with the publication of the book. It is a continent that is determined to fight for Catholic marriage and morality and is showing itself a "nova patria Christ Africa". 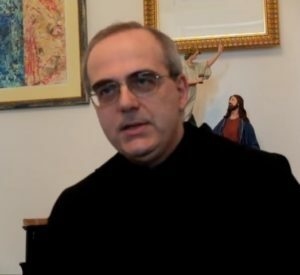 (Rome) Don Antonio Livi, the former dean of the Faculty of Arts of the Pontifical Lateran University is concerned with the "dubious basis of Kasper's proposal" ( Disputationes Theologicae ) on the divorced and remarried for the Synod of Bishops on the family in October. Pope Francis opened a games room for German Cardinal Walter Kasper to attack the teaching and practice of the Church by attempting to replace it with a new theology. It is a basis enough to illuminate the fundamentals of Cardinal Kasper's theology. The first part of Don Antonio Livi's analysis was published on the feast of St. Ignatius of Loyola, the founder of the Jesuit order, to which Pope Francis belongs, in Disputationes Theologicae entitled "The Eucharist Kasper." In addition to the danger of profaning the Sacrament of Penance, "we stand before the final attack of Gnostic-Masonic thinking against the Church of Christ", says Disputationes Theologicae . Don Livi is concerned with the implications of the conflict, by exposing the "Eucharistic theology" behind the Kasper-Propsal. Kasper's writings are "not very" original, suffering from an "obvious lack of proper theological methodology"
Antonio Livi's "first consideration" was to "primarily ecclesiologically and pastorally" find that Kasper's theological creativity shows "a lack of proper theological methodology evident in them." His theses "rarely" have original features, as Kasper is "content to repeat what was already represented his teachers, especially Karl Rahner." "In every single one of the theses advocated by Kasper" there is a lack, viewed from an epistemological point of view, of "that epistemic consistency indicated by true theology." Kasper's "theological research are not hypotheses (and also don't raise the claim) of offering a scientific interpretation of the Church through the Holy Scriptures, the dogmatic doctrines, liturgy and faith." They were "rather an ambiguous expression of a religious philosophy, an expression with which I refer to those arbitrary interpretations of Christianity's own religious terms by the major systems of historicizing idealism like that Hegel and Schelling brought forth in the 19th century." Of these systems of thought, "that are epistemologically, purely philosophical, primarily in the Lutheran milieu in which they have arisen, can be regarded theologically, to have affected many Catholic theologians including Walter Kasper in the 20th century whose formation was carried out by those at the Tübingen School, as he complacently writes in one of his early works. They have launched "a renewal of theology and of the entire German Catholicism" in the encounter with Schelling and Hegel, according to Kasper in his book on the absolute in history. Philosophy and Theology of History in the Later Philosophy of Schelling, Matthias-Grünewald-Verlag, Mainz, 1965. Kasper's "Throwback to the ideological positions of theologians condemned by the Holy See in the 19th century"
The so-called "encounter with Schelling and Hegel" was believed by the theologians of the Tübingen School as necessary to "renew" all the "conciliar" theology and with the Church, which is in fact an obscure throwback to the ideological positions that theologians (not coincidentally also German), who were sentenced in the 19th century by the Holy See because of the application of Hegel's and Schelling's categories of idealism to theology ". "The fact that in the 20th century Catholic scholars wanted a struggle against the metaphysical tradition in theology through the systematic adoption of a religious philosophy conflict that was developed in the Lutheran world and always criticized the Catholic, can have no other plausible explanation than in their psychological dependence on the Lutheran theologians, whose hegemony in German culture has always been absolute (Consider that even Kierkegaard's critique of Hegel emerged and remained within the Lutheran religious culture). "Between Hegel and Schelling" Kasper preferred latter, whom he "called, 'the solitary Great' " 1 , and "from the Gnostic character of his philosophical and religious studies, showed himself intrigued without feeling even any embarrassment because of their clearly pantheistic result.". Kasper's picking up "specifically Schelling's themes" recalls the analogous methodical decision of another German Catholic theologian, that of Klaus Hemmerle, in whose school Piero Coda has also been formed. This operates as a "theological method that is radically inconsistent with that of the true theology". Kasper's Summary of Schelling "a meaningless accumulation of words"
"What does it mean that the Christian revelation is essentially 'history'? The history of what, history by whom? Is the history of men (what Kasper calls nature) in relation to the action of God (the supernatural)' to understand)? "In this case, said Livi, it was about the theological concept of "salvation history", the salvific Initiative of God, Creator and Redeemer, who was revealed by God Himself to man, first through the prophets, then definitely by the Incarnation of the Word. "But that can not be Kasper's understanding, because that would correspond to all the traditional theological doctrine which is rejected according to Kasper but, since it implies a 'static-metaphysical-timeless' way, 'to conceive the relationship between natural and supernatural,'" says Livi. Kasper had admitted "(unconsciously) the distinction between the world (creation) and God (the Creator)" where God can not be equated with the "history", "unless you would ultimately exclude God from theological discourse, and only talk of the world and its affairs, even when it comes to the religious life and the Church. But that is what Kasper says, as will be shown. " "The frequent changes of theological propositions that have characterized the scientific and journalistic work Kaspers' leave, remember that" so much a viable proposal for the interpretation of the dogma of the "ultimate purpose" of his work is driven by the desire of its salvific implementation not in the lives of believers, but the urge to impose public opinion as a leading figure of the progressive wing of contemporary theology, especially in the context of ecumenism, thus the 'dialogue' with the Protestants, overlooking ritual and doctrine for an 'approach' between them and the Catholic Church." "In any case," Kasper's constant appeals for "reforms" in the Church - "whether institutional, liturgical, pastoral reforms - miss any necessary relation to the constitutive 'form' of the Church as a divine institution.'" That is clear "from the devaluation of the specifically theological principles of ecclesiology, the first place to the express recognition of the divine nature of Christ as the Incarnate Word, that the he founded the Church to continue his salvific mission through instructing the faithful preaching of the supernatural mysteries and of sanctifying grace the sacraments." "In fact, Kasper belongs entirely to those ideological current, which was headed by Hans Küng and Karl Rahner, and understands theology as anthropology, by recommending the Church, not so much from God, but to speak of the people. 11 In accordance with this precise speculative orientation, Kasper puts aside the discourse on the dual nature of Christ, the eternal Word, and reduces Christology to a phenomenological discourse on the conscience of Jesus, as a person who speaks of God,'" said Don Antonio Livi, who was from 2002 to his retirement in 2008, Dean of the Faculty of Arts of the Pontifical Lateran University in Rome.